Anthony Johnson's note said he was looking for a job "to make life worth living". 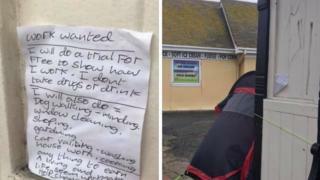 Charlotte said when she saw Anthony's note at the bus stop next to his tent it "broke her heart". Mr Johnson's note read: "I will do a trial for free to show how I work. I don't take drugs or drink. "I will also do dog walking/minding, window cleaning, shopping, gardening, car valeting/washing, housework, cooking..
"Anything to earn a living and make life seem worth living." Charlotte posted an appeal for donations online: "There is a caravan for sale and it cost £100, the goal is £300 as it needs some work done." Charlotte told BBC Sussex: "Everyone deserves a home." "I was worried he might be a bit overwhelmed by it, but he's loving it." After seeing Charlotte's appeal Nelson Smith offered Mr Johnson a job and the pair are now working to set up a handyman business. Mr Johnson told the Hastings Observer: "Getting a job is about having something to do rather than rotting away on a bench. It's about having something in your life." Charlotte said: "I wasn't expecting all this from a couple of [online] shares."